Though they’re touted as ideal for electronics, two-dimensional materials like graphene may be too flat and hard to stretch to serve in flexible, wearable devices. “Wavy” borophene might be better, according to Rice University scientists. 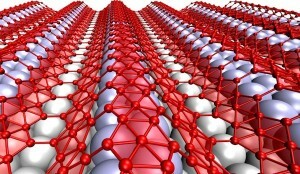 The Rice lab of theoretical physicist Boris Yakobson and experimental collaborators observed examples of naturally undulating, metallic borophene, an atom-thick layer of boron, and suggested that transferring it onto an elastic surface would preserve the material’s stretchability along with its useful electronic properties. This entry was posted in Group-related news and tagged boron, two-dimensional materials by e.penev. Bookmark the permalink.